K so good news and bad news... The good news is that I was able to figure out the System Recovery, erecovery, to restore back to factory settings. That is good news so I assume that you were able to boot to your recovery partition then. What method did you use to access it since you said that <Alt> <F10> did not work? Or is there a method reached by using All Programs -> Acer -> Recovery? Important: Did you restore your computer back to factory settings or not? However, it appears that you did just that or that the CDROM was set to the boot device by default on your Acer so you didn't have to. Just give it a look over to make sure you did what is described. Though the key combinations are different on different makes of Computers the concept is the same for all of them. Yes the Alt F10 was what worked, I didn't understand that I needed to be pressing it instead of F2. No I did not restore my computer, I was waiting for you to tell me whether that was a good idea or not. The detections in red show that you have a MBR rootkit (\Device\Harddisk0\DR0 is your hard drive). Unfortunately TDSSKiller is not able to remove it, and that would be the easiest and cleanest automatic removal method if it were possible but it is not. I don't believe you have the newest version of TDL4 which is the variant that creates a new hidden partition on your hard drive to store its file system. The reason I think this, is because your symptoms differ from those I wrote about in the Gparted article and Diskpart and Disk Management did not show any partitions that are unaccounted for. Furthermore, I inspected your MBR's partition table and there is no hidden partition, and your system reserved partition is the active partition, so it corroborates what Diskpart and Disk Mgt are reporting (all of that is legit). Using GParted was a way for me to look at your partitions by externally bypassing Windows, so I could crosscheck Diskpart and Disk Mgt's results. I do know you have an MBR rootkit, and the only cure for it is to overwrite your MBR with default Windows 7 code or to run two simple commands from the Windows Recovery Environment that should eliminate it. That sounds pretty simple and it is in theory, but doing that will also overwrite the code that enables you to access your recovery partition. That means we have a Catch 22 situation - because any attempts that we make to remove the rootkit will cause you to lose your ability to reinstall Windows. It wouldn't be so critical if you had a W7 installation CD or Recovery media, but the fact that you don't and your system for whatever reason fails to be able to boot to CD makes me very hesitant to try anything that will make you lose access to your Recovery Partition. Now, I am still mulling over what we should do. Alright, sounds like a complicated situation! Here is my two cents, if I lose my recovery partition, then I will be unable to reinstall windows, making it virtually impossible to fix my computer again in the future. If I do use the recovery partition to solve the virus issue, then maybe my cdrom boot will begin working again, and I'll still have the recovery partition to use in the future. But these two cents are probably worth literally two cents, lol..
Now for more questions... how do I know my external hard drive is not infected? Because if it is, wouldn't it just reinfect my computer after the reformatting process? 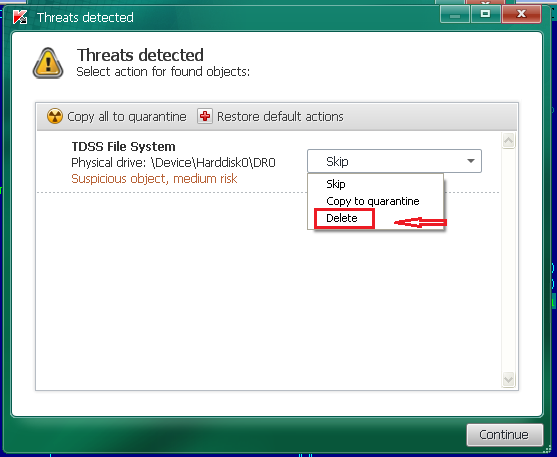 We also havn't tried deleting the MBR rootkit with TDSSKiller, we've tried copy to quarantine, but not delete. Might this work? Or are the infected files to important to my computer to just delete? Let's not worry about your external drive now since it's not a "boot" drive and the MBR rootkit is on your primary operating system drive. Is your browser still being redirected? If you do not find them, just continue with my instructions on running TDSSKiller. I want you to rerun TDSSKiller but this time select "Delete" on Action Choice window for all three of the above detections (see attached image that depicts how you should deal with these detections). Post back the TDSSKiller log. Should I run it again now? The New TDSSKiller scan showed no more issues! I'm quite sure the rootkit was already removed and the TDSS file system is an inactive leftover from the infection. Yes, reboot and run it again. We cross posted! That is what I suspected, so you are no longer infected and you do NOT have to restore your system!! Use Internet Explorer to navigate to the scanner website because you must approve install an ActiveX add-on to complete the scan. If you are using Vista or Windows 7, launch 32 bit Internet Explorer by right-clicking the Start Menu icon & selecting "Run as Administrator"
Remove found threats. is CHECKED!! Do NOT choose the option to uninstall the ESET Online Scanner with all its components because you need to retain the scan log for posting. Important: Do NOT choose the option to automatically uninstall or the ESET Scan log will be deleted!! Depending on your security settings, you may have to allow cookies and put the ESET website, www.eset.com, into the trusted zone of Internet Explorer if the scan has problems starting (in Vista this is a necessity as IE runs in Protected mode). To do that, on the Internet Explorer menu click Tools => Internet Options => Security => Trusted Sites => Sites. Then UNcheck "Require server verification for all sites in this zone" checkbox at the bottom of the dialog. Add the above www.eset.com url to the list of trusted sites, by inserting it in the blank box and clicking the Add button, then click Close. For cookies, choose the IE Privacy tab and add the above eset.com url to the exceptions list for cookie blocking. so wait do I have to use internet explorer? In the program listing, right-click plain old "Internet Explorer" and select "Run as Administrator". Do NOT use Internet Explorer (64-bit)!! Well, I have to go out now anyway so the length of the scan does not bother me! Just post the results when done - all indications show that your clean. It seems to me the ESET scanned turned up a fair amount of trojans... probably not a good sign. On the General tab, under Temporary Internet Files, click the Settings button. Note: This deletes ALL the Downloaded Applications and Applets from the CACHE. [*]Click OK to leave the Java Control Panel. I see your running SUPER Antispyware and MBAM but I don't see that your running an Antivirus so you need to get one. There are three free AV's that I highly recommend! Download one of the above and then perform a new DDS scan for me and post DDS.txt and attach the attach.txt this time. how do I access classic view in control panel? Got it, would you recommend getting the malwarebytes pro instead of these free options? mRun: [EgisTecPMMUpdate] "C:\Program Files (x86)\EgisTec IPS\PmmUpdate.exe"
mRun: [MDS_Menu] "C:\Program Files (x86)\Acer Arcade Deluxe\MediaShow Espresso\MUITransfer\MUIStartMenu.exe" "C:\Program Files (x86)\Acer Arcade Deluxe\MediaShow Espresso" UpdateWithCreateOnce "Software\CyberLink\MediaShow Espresso\5.6"
mRun: [Adobe Reader Speed Launcher] "C:\Program Files (x86)\Adobe\Reader 9.0\Reader\Reader_sl.exe"
mRun-x64: [EgisTecPMMUpdate] "C:\Program Files (x86)\EgisTec IPS\PmmUpdate.exe"
mRun-x64: [MDS_Menu] "C:\Program Files (x86)\Acer Arcade Deluxe\MediaShow Espresso\MUITransfer\MUIStartMenu.exe" "C:\Program Files (x86)\Acer Arcade Deluxe\MediaShow Espresso" UpdateWithCreateOnce "Software\CyberLink\MediaShow Espresso\5.6"
mRun-x64: [Adobe Reader Speed Launcher] "C:\Program Files (x86)\Adobe\Reader 9.0\Reader\Reader_sl.exe"